This post is the first in a series I call “Back to Basics” to discuss the fundamentals of daily skin care. Soaps are great for the body are not so great when used on the face. Soap removes the naturally occurring oil protection and leaves the skin totally bare. The oil is there to create a barrier against outside aggression, such as bacteria, dust, wind, pollution. This oil is produced by oil glands (or sebaceous glands) located in our own skin. Once on the skin surface, the oil acts as a sheer cover. The ph of the sebum is slightly acidic, therefore destroying bacteria it comes in contact with. When using soap all this protection is washed off and the skin responds by producing more oil. For oily skin this is not good, as it creates a vicious circle of washing and producing more oil than needed, then washing again…In the long run oily skin becomes sensitized and the sensitivity will last a life time, even after the oil production slows down with age. Dry skin will just feel taut, because the amount of sebum it produces is too small to begin with, so after washing it off you feel like your skin has shrunk. In the long run, this is one of the reasons why some very young people develop wrinkles long before their time. 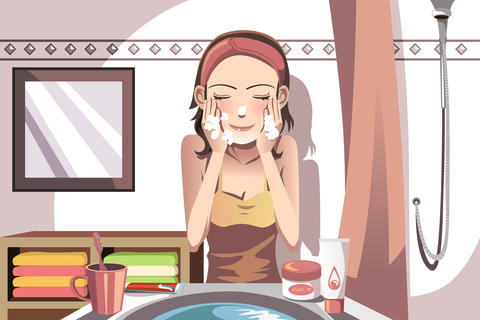 Cleansing the skin at night is an absolute must if we want to keep looking fresh and wrinkle free for a long time. However, soap is not the answer for the reasons I just mentioned above. There are solutions that work well without the nasty side effects. Cleansers and toners, or face washes are the alternative and we’ll discuss them in detail in a future post. Until then, take good care of yourself.